NAPIER, Illinois — Anti-gay activist Peter LaBarbera is back home in Illinois after spending 24 hours in custody in Canada for demonstrating against homosexuality and abortion at the University of Regina in Saskatchewan. Peter LaBarbera, arrested in Canada on April 14, 2014. LaBarbera, president of the anti-gay group Americans for Truth about Homosexuality (AFTAH), was charged with criminal mischief on Monday, just days after he was detained by Canadian Border Services officials. LaBarbera told LGBTQ Nation on Tuesday evening that he is scheduled to appear in court on May 26 to answer the charges. After spending the night in jail, he voluntarily agreed to cut his Canadian visit short, and return home to the U.S. two days earlier than planned. LaBarbera was initially denied entry to Canada on April 10 after LGBT rights advocates complained to authorities that his history as an anti-gay activist and intended speech at a pro-life conference might violate Canada’s hate speech laws. He was eventually allowed into the country on the condition that he “would not violate Canadian law,” LaBarbera said. 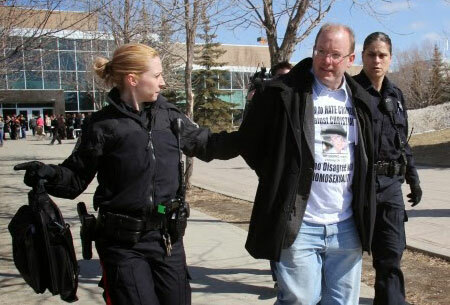 LaBarbera told LGBTQ Nation that he didn’t think his appearance alongside Canadian anti-abortion activist Bill Whatcott, who was also arrested, would be a violation of his agreement with the Border Services Agency. LaBarbera and Whatcott were arrested while distributing anti-gay and anti-abortion literature on the University campus and carrying signs that contained images of aborted fetuses. The men were wearing shirts that contained anti-gay messaging. LaBarbera’s group, Americans for Truth about Homosexuality (AFTAH), has been designated an anti-gay hate group by the Southern Poverty Law Center.